Compared to other alcoholic beverages, red wine doesn’t suffer much of an image problem – recent headlines have credited the drink with helping the French stay svelte without sacrificing high-fat foods, while other news stories have touted its cardiovascular benefits. Although research does support the notion that red wine’s moderate alcohol content and high concentration of flavonoids may help prevent blood clots and hardening of the arteries, its effect on body weight isn’t so clearly defined. Increasing your physical activity and making smart dietary choices are the two basic tenets of any healthy weight-loss program. To give your body what it needs while watching your daily caloric intake, dietitians often recommend choosing nutrient-dense foods, or those that supply higher levels of nutrients per calorie, over energy-dense foods, or those that supply few nutrients and are relatively high in calories. Although red wine is rich in beneficial phytochemicals, it only contains trace amounts of potassium, iron, B vitamins and other essential micro-nutrients. Because these trace nutrients are delivered in a high-calorie package – the average red table wine provides 125 calories per 5-ounce serving – red wine isn’t an ideal choice for someone who’s actively trying to lose weight. Red wine contains alcohol, a concentrated source of energy that provides 7 calories per gram. By comparison, you’ll get 4 calories from a gram of protein or a gram of carbohydrates, and about 9 calories from a gram of fat. To lose weight when alcohol is a regular part of your diet, you have to compensate for its calories. This may not always be an easy thing to do however; a 2010 article published in the journal Physiology & Behavior notes that alcohol tends to qualify as “additive” calories when people drink with food. That is, most people don’t consume fewer food calories when alcohol is served at mealtime. Instead, drinking wine or any other alcohol with your meal makes you more likely to passively increase in your total caloric intake, which, when done habitually, can set you up for weight gain. Although red wine won’t necessarily do you any favors when it comes to weight loss, it might be able to help you maintain a healthy body weight long-term. An eight-year study of more than 19,000 middle-aged women published in the Archives of Internal Medicine in 2010 concluded that normal-weight women who drink a moderate amount of alcohol, such as a glass of red wine a day, are less likely to become overweight or obese as they age than women who don’t drink. Similarly, scientists who followed nearly 16,000 middle-aged women in a seven-year prospective cohort study for the Women’s Health Initiative concluded in 2012 that women who drink moderately are more likely to maintain a healthy weight as they age than nondrinkers. The study’s authors went even further, noting that wine protects against weight gain more effectively than liquor or beer. Despite the potential health benefits of red wine, drinking alcohol of any kind comes with risks. As the Harvard T.H. Chan School of Public Health points out, "alcohol is both a tonic and a poison", depending on how much you consume. Because alcohol affects individuals differently, there’s no universal consensus on what constitutes a standard drink, just as “moderate drinking” hasn’t been officially defined. 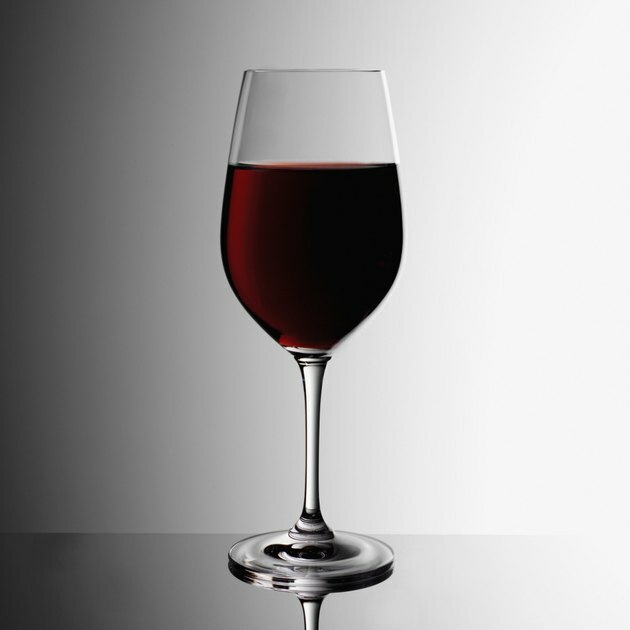 In the United States, a 5-ounce glass of red wine, which is 12 percent alcohol by weight, constitutes one drink. Moderate drinking is generally defined as no more than two drinks a day for men, and no more than one drink a day for women. In addition to the potential for weight gain, drinking more than the moderate amount of alcohol can cause a host of health problems, including liver inflammation, high blood pressure and a significantly increased risk of cancer. If you don’t already drink red wine, there’s no need to start – moderate physical activity and a whole-foods based diet that’s both high in fiber and low in added sugars can promote cardiovascular health and help you lose weight. And if you’re still looking for that magic weight-loss beverage, try water – a 2015 study in the journal Obesity found that drinking 16 ounces of water about half an hour before mealtime can help you consume fewer calories when you sit down to eat. Physiology &amp; Behavior: Alcohol, Appetite and Energy Balance – Is Alcohol Intake a Risk Factor for Obesity?